"This is a real bombshell in the field of neuroscience," says Terry Sejnowski, Salk professor and co-senior author of the paper, which was published in eLife. "We discovered the key to unlocking the design principle for how hippocampal neurons function with low energy but high computation power. Our new measurements of the brain's memory capacity increase conservative estimates by a factor of 10 to at least a petabyte, in the same ballpark as the World Wide Web." Our memories and thoughts are the result of patterns of electrical and chemical activity in the brain. A key part of the activity happens when branches of neurons, much like electrical wire, interact at certain junctions, known as synapses. An output 'wire' (an axon) from one neuron connects to an input 'wire' (a dendrite) of a second neuron. Signals travel across the synapse as chemicals called neurotransmitters to tell the receiving neuron whether to convey an electrical signal to other neurons. Each neuron can have thousands of these synapses with thousands of other neurons. "When we first reconstructed every dendrite, axon, glial process, and synapse from a volume of hippocampus the size of a single red blood cell, we were somewhat bewildered by the complexity and diversity amongst the synapses," says Kristen Harris, co-senior author of the work and professor of neuroscience at the University of Texas, Austin. "While I had hoped to learn fundamental principles about how the brain is organized from these detailed reconstructions, I have been truly amazed at the precision obtained in the analyses of this report." At first, the researchers didn't think much of this duplicity, which occurs about 10 percent of the time in the hippocampus. But Tom Bartol, a Salk staff scientist, had an idea: if they could measure the difference between two very similar synapses such as these, they might glean insight into synaptic sizes, which so far had only been classified in the field as small, medium and large. "We were amazed to find that the difference in the sizes of the pairs of synapses were very small, on average, only about eight percent different in size. No one thought it would be such a small difference. This was a curveball from nature," says Bartol. 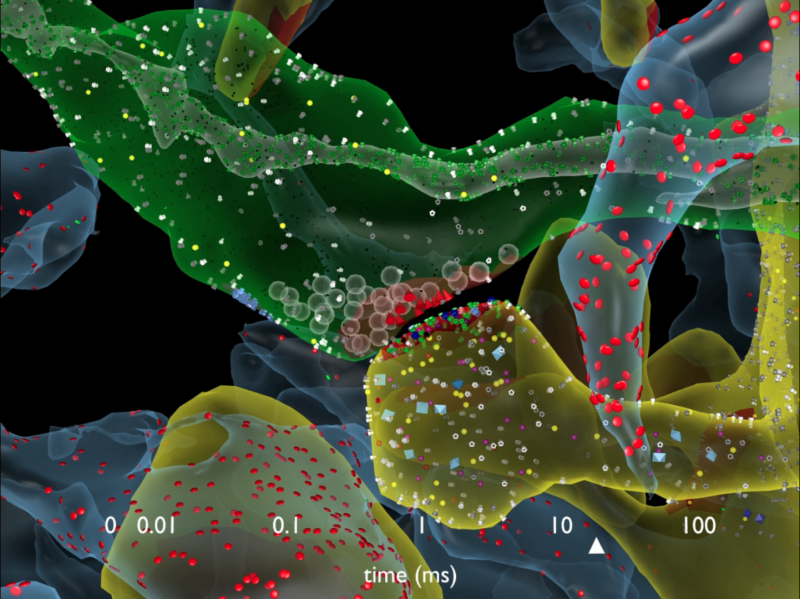 "Our data suggests there are 10 times more discrete sizes of synapses than previously thought," says Bartol. 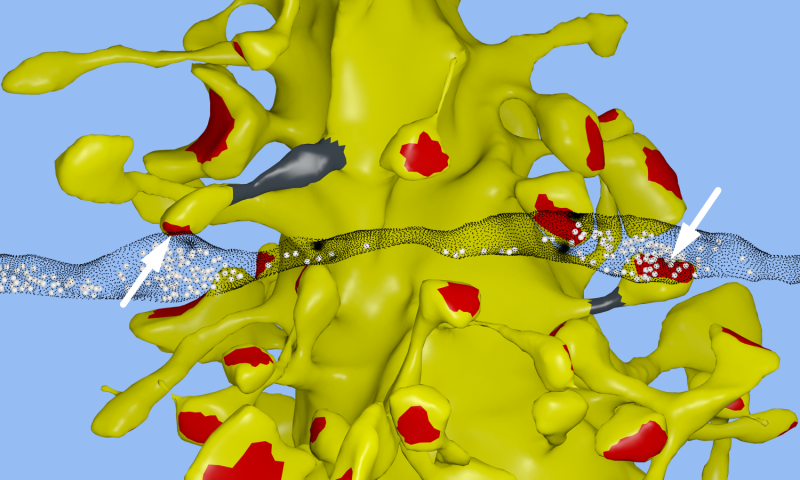 In computer terms, 26 sizes of synapses correspond to about 4.7 "bits" of information. Previously, it was thought that the brain was capable of just one to two bits for short and long memory storage in the hippocampus. "This is roughly an order of magnitude of precision more than anyone has ever imagined," says Sejnowski. "We had often wondered how the remarkable precision of the brain can come out of such unreliable synapses," says Bartol. One answer, it seems, is in the constant adjustment of synapses, averaging out their success and failure rates over time. The team used their new data and a statistical model to find out how many signals it would take a pair of synapses to get to that eight percent difference. "Our prior work had hinted at the possibility that spines and axons that synapse together would be similar in size, but the reality of the precision is truly remarkable and lays the foundation for whole new ways to think about brains and computers," says Harris. "The work resulting from this collaboration has opened a new chapter in the search for learning and memory mechanisms." Harris adds that the findings suggest more questions to explore, for example, if similar rules apply for synapses in other regions of the brain and how those rules differ during development and as synapses change during the initial stages of learning. "The implications of what we found are far-reaching," adds Sejnowski. "Hidden under the apparent chaos and messiness of the brain is an underlying precision to the size and shapes of synapses that was hidden from us." The findings also offer a valuable explanation for the brain's surprising efficiency. The waking adult brain generates only about 20 watts of continuous power—as much as a very dim light bulb. The Salk discovery could help computer scientists build ultraprecise, but energy-efficient, computers, particularly ones that employ "deep learning" and artificial neural nets—techniques capable of sophisticated learning and analysis, such as speech, object recognition and translation. "This trick of the brain absolutely points to a way to design better computers," says Sejnowski. "Using probabilistic transmission turns out to be as accurate and require much less energy for both computers and brains." 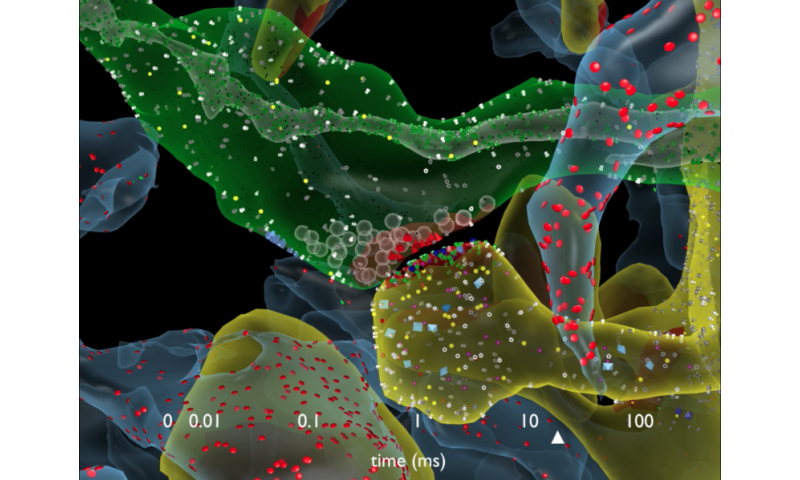 Static synapses on a moving structure: Mind the gap!